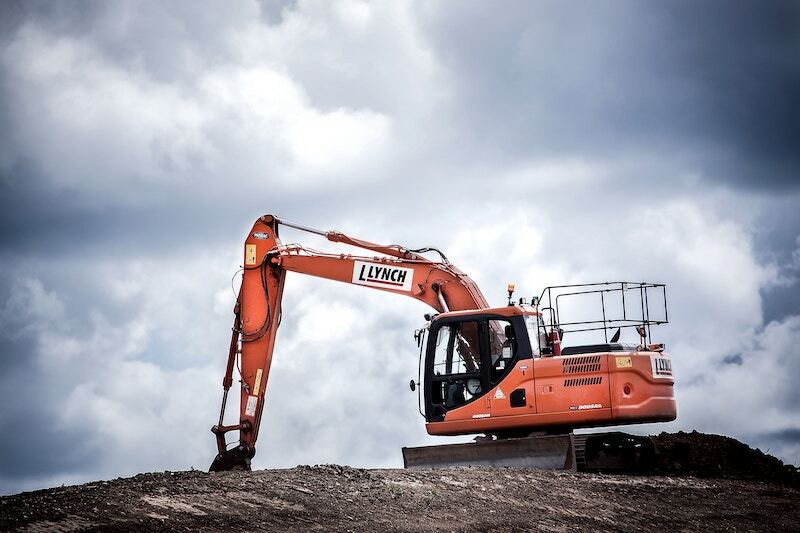 Scheduling service calls is often quite complex. Teamup can keep all the information organized and everyone’s schedules updated. Service-based companies often have multiple technicians who need to do routine inspections, as well as maintenance calls and repairs. Technicians may also need to make time for delivery and installation of products. Scheduling service calls is often a combination of fixed and variable events, with different recurrence schedules and with multiple people involved. It can be quite complex, but you don’t need to run back to spreadsheets. Teamup can keep all the information organized and everyone’s schedules updated. Let’s look at a scenario to show how Teamup can work with this type of business. In addition, OnSite encourages their more experienced technicians to help develop younger, newer techs. When younger technicians have open time, a more experienced tech might ask one to come and assist on service or inspection. To organize their service schedule, OnSite first creates 2 sub-calendar folders: Jobs and Staff. 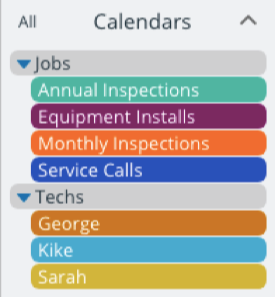 In the Jobs folder, they create a sub-calendar for Annual Inspections, one for Monthly Inspections, one for Service Calls, and one for Equipment Installs. In the second folder, Staff, they create a sub-calendar for each technician, which means 30 sub-calendars in this folder. Keeping the sub-calendars organized by folders helps the Onsite team to organize and manage the schedule much easier. Next, they ensure that the technicians’ calendars are set to disallow overlapping events to avoid scheduling conflict. They also choose to have event comments enabled by default for all new events. 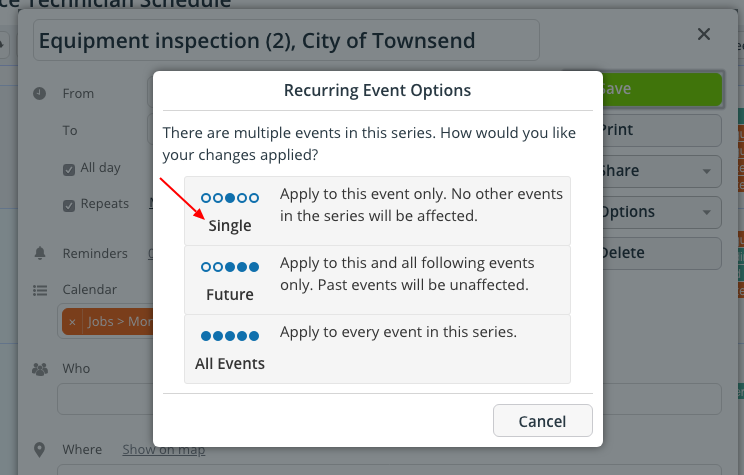 Within Teamup calendar, the team at OnSite can schedule recurring events. This is perfect for the inspections, which are done on a monthly or yearly basis. When needed, they can apply changes for a single event from the recurring series, or for the entire series. You can customize the options for each repeating event. For example, if a customer updates their contact information, it can then be updated on all future instances of the scheduled monthly inspection. Another example: a customer’s monthly inspection is delayed due to inclement weather. The scheduling manager can adjust the current month’s inspection to another time and save the change for that instance, only. The remaining scheduled monthly inspections are unchanged. Pre-scheduling all recurring events gives the OnSite team an easy way to view jobs for the entire year, using the yearly view. The yearly view shows each month in a row; you can adjust the dates to see a different selection of months. They can estimate their workload based on scheduled inspections plus estimated service calls and installs. This broader perspective helps them to plan for hiring more technicians when needed, rather than waiting until they are overloaded with work. Assign this job also to the technician’s calendar. Learn more about assigning one event to multiple calendars. Save the changes, making sure to save it to this event only. If a technician has scheduled time off, it is also added to the technician’s calendar. Since the technicians’ sub-calendars are set to disallow overlapping events, they can’t be scheduled to a job if their schedule for that time is already full–with another scheduled job, or with booked time off. You can save changes to a single instance or to every instance in a series. Green for technicians who can do all jobs and don’t have a specific specialization. Orange for technicians who can do some inspections and services, but not all. Blue for technicians who have specific certifications and specializations. Red is reserved for new technicians who are still in training. OnSite uses a code system to designate the services, repairs, and specializations. This code is added to the title of each technician’s sub-calendar, if needed. For example, Bob is certified to do repairs on Bobcat brand equipment; his calendar is called “BCT Bob.” They can edit the contents of the About box on the sidebar of the calendar to include a list of these abbreviations and what each one means. Color-coding and abbreviations make it easy to keep techs organized. The OnSite technicians subscribe to email notifications; when they are assigned to a job or when changes occur to the job they have been assigned to, they receive an email notifying them of the additions or change. The calendar administrator can manage the notifications in Settings. 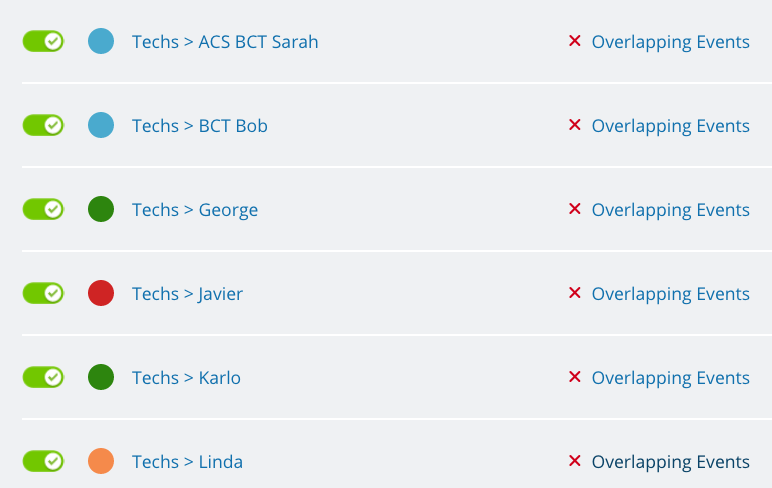 Technicians can also sign into their Teamup calendar using a web browser or the Teamup mobile apps. 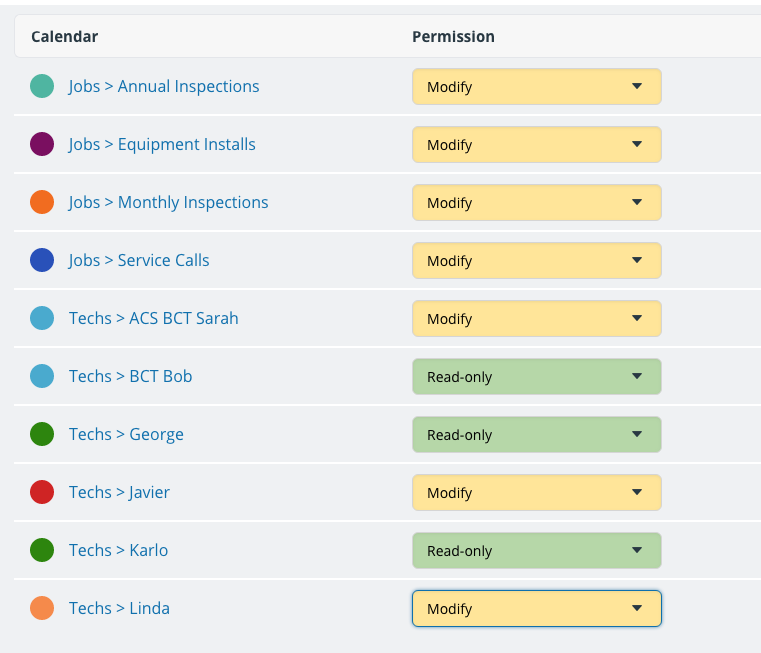 To enable them to do so, each technicians is given a unique calendar link with appropriate access permissions. The access permissions determine what people can do with each sub-calendar: for example, a permission could allow the user to read only, add only, or modify (change events and add new ones). You can customize the access permissions for each sub-calendar. OnSite has several senior-level technicians who help managing and training the newer or less experienced techs. These senior-level techs have calendar links with modify permission for the sub-calendars they need to use: all of the sub-calendars in the Jobs folder, and the sub-calendars for the younger technicians they oversee. All other technicians have add-only links for their sub-calendars; this way they can input information, if needed, but cannot modify or delete jobs that are on their calendars. It’s important the the OnSite technicians keep records of the work they do for each inspection and service call. Previously, they used a separate program for inputting notes and images. Someone in the office then had to upload the technician’s notes to the appropriate calendar event. With Teamup, however, the technicians use the event comments. They can upload images and add notes straight to the calendar, using a mobile device when they’re on site. 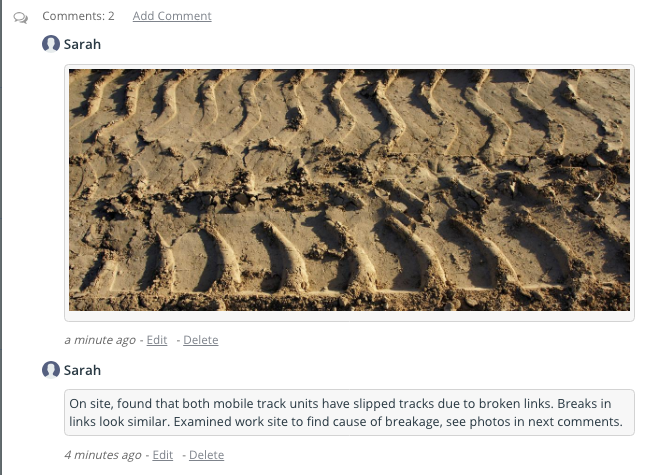 The technicians can add notes and upload images to event comments. 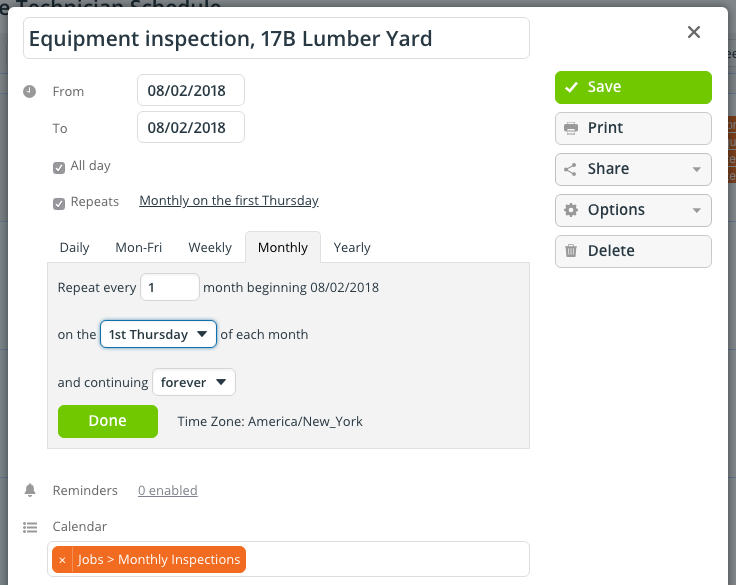 All notes and images stay with the event; not only are records automatically organized by the date of the inspection, they’re also searchable using Teamup’s keyword filter. For more ideas about how companies are using a Teamup calendar, check out these stories. Or try out a demo calendar and see for yourself how Teamup can make scheduling service calls easier and more efficient. Header photo by Luke Besley on Unsplash. « What’s the difference between “exit” and “logout”?